Oct. 24, 2017 - Trump enjoys far stronger support among members of the military than the American public at large, according to the latest scientific Military Times poll. 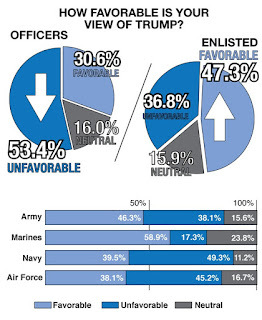 Yet while Trump is especially popular among enlisted troops, officers have a much lower opinion of him. And women and minorities in the ranks share similar skepticism. Overall, about 44 percent of all troops surveyed in the Military Times poll have a favorable view of Trump, while roughly 40 percent have an unfavorable opinion of him. That’s a stark contrast to opinion polls of the general public, which have shown Trump’s popularity at less than 40 percent and an unfavorable rating as high as 56 percent. Yet, the poll of more than 1,100 active-duty troops, conducted in September, shows a deep divide over service members’ opinions of the commander in chief, whose first nine months in office have been marked by military policies that have drawn both praise and concern from Pentagon leaders. While almost 48 percent of enlisted troops approve of Trump, only about 30 percent of officers say the same, the poll shows. When asked specifically about Trump’s handling of military policies, about 55 percent of all troops surveyed rated Trump’s policies as favorable, versus 26 percent unfavorable. The poll was conducted before the latest controversy surrounding Trump’s handling of phone calls to the families of fallen service members. Troops’ views on Trump have changed very little since he was elected last year.